Go behind enemy lines with the ultimate modern military shooter. Choose your own path to accomplish your missions across an unforgiven open world. Be a Sniper: Engage your targets from the long range. Factor in scope elevation, wind speed and direction, breath control and stance along with weapon and bullet choice. Be a Ghost: Stalk your enemies and eliminate them silently with a broad variety of takedowns. The advanced stealth gameplay includes drone recon and vertical navigation. Be a Warrior: Wield a wide variety of advanced weapons and modify them to suit the needs of your mission and your own personal style. Choose from assault rifles, shotguns, machine guns and even explosives. Be All Three: You are an American sniper dropped behind enemy lines in Georgia, near the Russian border. Ruthless warlords have taken over part of the area and it falls on you to prevent the entire country from collapsing into chaos. Explore large open world maps with dynamic weather and a day/night cycle that actually impacts your play and decisions. Sniper Ghost Warrior 3 is the story of brotherhood, faith and betrayal in a land soaked in the blood of civil war. 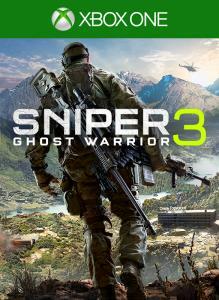 Buy now and get: • Sniper Ghost Warrior 3 (base game) • Season Pass Buy now and get ready for a full season of amazing content with the Sniper Ghost Warrior 3 SEASON PASS.